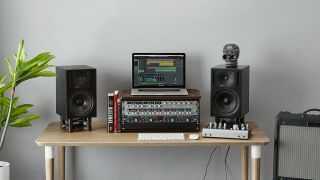 Earlier this month, Audient announced that their most powerful audio interface yet is now shipping. iD44 was designed ‘For The Creatives’, so we thought we would take a look at some of the features that will help spark your creativity. Instead of spending countless hours drawing in automation by hand, Audient created have an ingenious way of combining hardware and software to give you hands on control with your DAW. By hovering your mouse over a parameter and moving the volume encoder, you are able to adjust the parameter value (for scroll enabled software) - think of it as a virtual scroll wheel. This lets you move away from the mouse and means you can adjust settings and write automation as if you were using an actual piece of hardware gear. It’s a great feature for controlling volume automation or adjusting your delay feedback on the fly. Most people will appreciate the frustration of having an idea and losing it while running around trying to get everything set up. With iD44’s standalone mode, you can save and recall custom settings and routing so that when iD44 is turned on, it is ready to go with your exact headphone monitoring preferences and routing to any outboard, speakers or digital equipment. When you combine this with having your own custom DAW project templates, you can be capturing that fleeting idea in a matter of seconds. One of the big things that can stifle creativity is not having things set up the way you need them. With iD44’s Cue Mixes, an artist can have an easy to set up, completely custom headphone mix, letting them hear exactly what they need to in order to perform that moment of creative magic, all while the engineer can be listening to the full mix. These Cues can also be used to route audio out of iD44. Ever wanted to track vocals in the same room as the artist but didn’t have another headphone out? As well as being able to control headphone outs with the cue mix, there’s also another headphone out, so you and the artist both have independent control over your set volumes. You could even load up a couple of Amp Sims in your DAW and jam with your friends using the two D.I inputs on the front of iD44. Not a guitarist? No problem. These D.I’s sound great on a whole load of other instruments - plug in your synths and get recording right away.